NORTH PERTH – Thanks to a contribution from two local businesses, area children will be able to enjoy the benefits of playing minor sports. Recent cooking classes put on by the Kitchen Cupboard and Icebox and Feige’s Gourmet Dressing brought in over $2,500, money that was redirected into the North Perth Sports for Kids Fund in a presentation made on July 9. Distributed by the Stratford-Perth Community Foundation, Sports for Kids dollars financially assist local families that otherwise wouldn’t be able to afford the registration/equipment costs of minor sports for their children. The fund also helps out families enrolling their kids in activities such as dancing or karate, and even those who have transportation difficulties. “The North Perth community has really taken ownership of this fund,” said Stratford-Perth Community Foundation community outreach coordinator Roxy Rae at the announcement last week. Partnered with the Municipality of North Perth and the local branch of the Salvation Army, the Stratford-Perth Community Foundation has assisted countless families through the Sports for Kids Fund since it was launched in October 2010. The annual Bill McLaughlin Memorial Golf Tournament – in memory of the former Listowel resident – is one of the fund’s largest contributors. Those looking to apply for assistance through the North Perth Sports for Kids Fund can contact the Salvation Army family services centre at 326 Main St. E. in Listowel or call 519-291-2900. Applications can also be made at the North Perth municipal office. SPORTS FOR KIDS – North Perth Sports for Kids got a helping hand from two local businesses on July 9, as The Kitchen Cupboard and Icebox along with Feige’s Gourmet Dressing contributed $2,585 to the local program that aids local families financially in getting their children into minor sports. 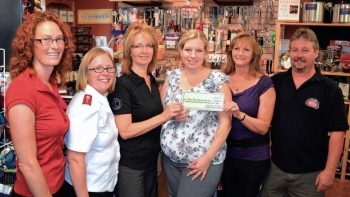 Pictured from left: North Perth recreation program coordinator Amy Gangl, Listowel Salvation Army director of family services Captain Naomi Dalley, Kitchen Cupboard owner Karen Havercamp, Stratford Perth Community Foundation community outreach coordinator Roxy Rae, and Feige’s owners Monica Filman and Mark Snowden.